I enjoy gambling and have done for about a decade but never made any money tbh. Last year I started following tipsters and honestly made money doing so for the first time ever! And continue to do so today. But before I did, i followed a couple of twitter tipsters who promised a lot but delivered a loss. I therefore decided to review tipsters honestly using stats and make it easier for people to choose the right tipster for them. I also wanted to create useful content for people who may have questions about gambling and tipsters in general. If you're interested in either gambling, tipsters or both, check out the site I'll add new content all the time- if you have any topics you want written about or tipsters reviewed, let me know! Yep- the tipsters I review do cost money to follow. You have to weigh up the cost versus the potential profit in your head. You can try most of them out for ten days for a quid anyway to see if you like or see value in it. If these tipsters are so good, why do they need our money as they could surely generate enough cash on their own with their great tipping skills. Think about that one. Somebody I know (not a friend) makes a living as a tipster which surprised me as me and my mates love horse racing and yet I had never had a conversation with this guy about betting. He admitted he has little knowledge and plays the percentage game. So if 5 people ask for a tip in a race he will give 5 different answers chances are that one of those people will win and think he knows his stuff. He said people follow me until they realise that I have no real insight then I just change my tipster name and start again frequently picking up the same customers. At the end of the day it is not illegal as all he is doing is offering an opinion which people pay for. I suspect that others may be doing the same thing to some degree so you have been warned. Pricewise in the Post is doing OK, Paul Kealy in the same rag is a fine under-stated tipster - and 10 year trends, great for the big handicaps don't bother with the small field conditions races - henry rix of today was almost clairvoyant - guys like him do their private tipping line and it will cost , but the bookies will always be on to them, it's their living, Ladbrokes made the KGB look like amateurs, if they offered shorter odds the horse was up for it, longer odds and it would blow out, not so straightforward now bcos they can't give away too many clues. I bet considerable sums everyday on horses. I use tipsters only. I’ve lost every bookie apart from 1 or 2 small ones. I now use mostly exchanges (have lost BOG so consider price available or BFSP Betfair Exchange SP) which is nicer in a way because I can bet more stakes and my money is always available as opposed to fretting on when to withdraw an amount that might raise eyebrows and get my account scrutinised. I might make a few less points, a lower ROI, but these tipsters I use are good, and anyone rolling bigger sums is going to experience this. Watching the in the know trades on Betfair just before starting post they’d be restricted asap or never get to place bets. Yes I know bookies restricting accounts are about how much you beat SP Starting Price first and foremost but bookies will always hate profitable customers at some point. There are ratings they use on customers i e recently seen and it’s scandalous what they do with losing customers. I use mainly paid for tipsters but that’s because I prefer to pick good paid for tipsters that tip when it suits me, often in the morning rather than night before, which gets your accounts closed sooner. It is difficult to turn a good profit backing in the morning but it is possible. I’m doing it. It’s not because free tipsters aren’t good like you’re saying, because there are some good ones. They’re on twitter if you know which tweeters to follow who track and record tipster results. I do. I’ve been using one free tipster for a long time making 150-200 points per year. He tips 3 horses usually around 3-6am on his website or fellas like him have a league table on platforms like betshare or OLGB that have league tables to tell you who is profitable. His prices are mostly available at 7am and 8am. People are put off him because they back each way due to the odds, lose a lot more, haven’t organised a betting bank and psychology to deal with 20 point downswings before he turns it round very quickly. You should only bet how the tipster bets. If they bet win only then so should you, and if you can’t afford that then you should either be betting 1% or lower of your betting bank win only. I’m currently using another. He tweets one quite fancied horse every mid morning with a time warning before. It’s not odds on but short odds, although he’s started tipping longer odds, up to 5/1 maybe. His ROI is unbelievably good. 40-50% which is extraordinary, but the odds shorten quickly. As long as you take no more than 25% shorter than the advised odds then you should be alright, as long as they’re a good tipster. Question. Is it you selling this one tip per day, £30 per month for one horse per day, £30 for 1 dog, £30 for 1 football tip? Are you getting these tips from somewhere else and charging on your own service? On dogs, accounts get closed pretty quickly and for good reason. They make more money. Did you say they make less? If you want to use the exchange you’ve got about 3 minutes before to place but at shorter odds. Dog betting is short lived. Pointless. Facebook is the wrong place to find good free tipsters. Twitter is where it happens but you have to know who is recording and displaying the results. Yep- also had BOG taken off me and the likes. Trying to keep most of my accounts alive by doing the occasional random acca for example and flying under the radar that way but it's tough! Some tipsters do 1 tip a day max and others do 4-6 so it varies on the service really. In terms of selling or providing tips, I don't sell any tips myself. I am simply a punter who enjoys gambling, stats and writing. I also think that there are loads of s*** tipsters out there so I review tipsters and give them my honest score and then people can choose which ones to follow, if any at all. 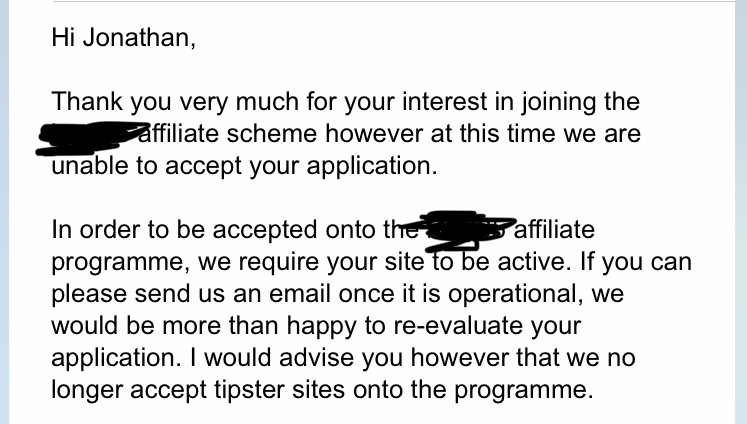 You obviously use several paid for tipsters- can you PM me the details of any decent ones that you think I could review? I have a few i'm currently working on reviewing (Quentin Franks, Dancing Brave etc) but always good to add some to the list for future reviews. Twitter is where this is at and where anyone showing signs of good performance can be found because they’re being tracked all the time. A few people do ratings from experience but from my experience you have to strike while the iron is hot on tipsters. I use 4 or so and may change now and then. I’ll PM you the twitter handles of people tracking them. I don’t bother outside of twitter because quite frankly I don’t trust anyone outsider of twitter with their proofing, because I’ve seen it for what it is. Rubbish or lies. Twitter has people tracking it by people who have no possible vested interest in these tipsters. Actually I’m having 2nd thoughts about passing this on because although the tipsters might make more money from subscriptions, it can quite easily end the profit when there’s many more people placing these bets within a 10 minute period. Some tipsters limit their subscriptions rather than get greedy whereas others don’t care and encounter these problems.